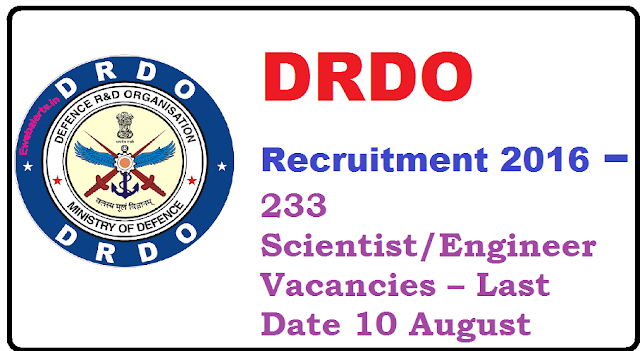 Defence Research and Development Organisation (DRDO) invites application for the post of 233 Scientist/Engineer `B’ in DRDO/ADA Based on Valid GATE 2015/2016 Score. Apply Online before 10 August 2016. Educational Qualification : First Class Bachelor’s Degree in Engineering or Technology in Electronics & Communication/Mechanical/Computer Science & Engg /Aeronautical Engg from a recognized university or equivalent OR First Class Master’s Degree in Physics from a recognized University or equivalent. Application Fee : General/OBC candidates have to pay Rs.100/‐ payable online only. However there is no application fees for SC/ST /PWD and women candidates. How to Apply DRDO Vacancy : Interested candidates may apply Online through the website http://rac.gov.in from 20.07.2016 to 10.08.2016.